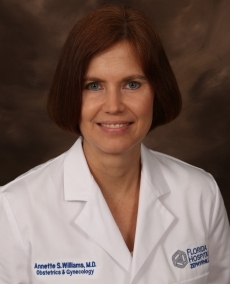 Dr. Annette Williams is a Board Certified OB-GYN who has been practicing since 1998, first as an active-duty military physician, and later in private practice and as a hospitalist at Florida Hospital Zephyrhills. She earned her medical degree at Loma Linda School of Medicine in California while in the U.S. Army Reserves, and completed her residency in obstetrics and gynecology at the San Antonio Uniformed Services Health Education Consortium, at Lackland Air Force Base in Texas. She went on to serve as OB-GYN Department Chair at Ireland Army Community Hospital in Fort Knox, Ky., and was a private physician and contractor before relocating to Pasco County in 2008. Dr. Williams is trained in robotic surgery and offers this minimally invasive option when treating gynecologic conditions such as hysterectomy, uterine fibroids, endometrioses and excessive bleeding.